Three free promo codes for Lumberwhack:Defend the Wild! Simply copy one of the codes below and redeem it at the iTunes App Store. If it does not work, it means that someone beat you to it, try another one. Appolicious recommends Lumberwhack as an app worth downloading in a recent article. Who’s it for? 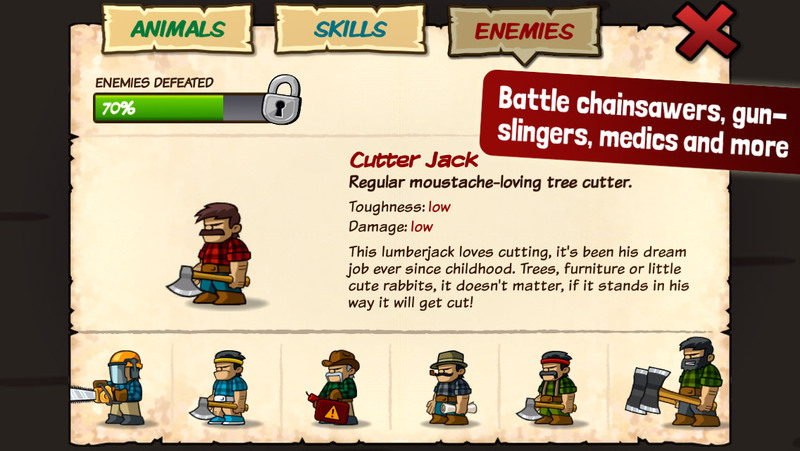 Fans of side-scrolling defense titles will find lots of levels, upgrades and soldiers make Lumberwhack a fun entry into the genre. What’s it like? There are a lot of similar mechanics and ideas at play in Army of Darkness Defense.